A multi-track, fully accredited, conference program will be held alongside the MEDLAB Asia Pacific exhibition, featuring an unparalleled education and management solutions program to help labs excel. Disposable medical supplies, medical dressings and medical materials, biopharmaceutical products etc. Mediconex collaborates with some of the leading medical societies to introduce unique educational CME accredited conferences and workshops for medical professionals. The premier edition of Medlab North Africa, the region's only dedicated laboratory exhibition will take place alongside Mediconex 2018. CPhI Japan is the country's most comprehensive pharma event, bringing more than 20,000 pharma industry professionals together from over 55 countries. Expect to find a wide range of exhibitors active in all pharma sectors in Japan as well as free seminars presented by governmental bodies and other important institutions. Hosting exhibitors from ingredients, contract services and biopharma through to technology, packaging and machinery, CPhI Japan and co-located events is your ultimate one-stop-shop to find the latest Japanese pharma solutions. Pharmaceutical raw materials, chemical intermediates, plant and animal extracts, fine chemical products, active ingredients alkaloids, antibiotics, biological enzymes, hormones and synthetics, biochemicals, phospholipids, pigments and dispersants, diagnostic reagents, serums and vaccines. APIs: chemical pharmaceutical raw materials, pharmaceutical intermediates, auxiliaries, fine chemical products, diagnostic reagents, biotechnology, extracts, etc. Medicinal accessories, etc. Pharmaceutical industry: raw materials and components, intermediates for pharmaceutical industry, pharmaceutical equipment, pharmaceutical packaging, laboratory equipment and reagents, control equipment, clinical research, clean room technology, pharmaceutical engineering, personal protective equipment, equipment required for quality inspection and consumer products and auxiliary software required by the pharmaceutical industry. This exhibition is very important for Bangladesh and its healthcare industry as a whole since offers an industry specific showcase of hospital, pharmaceutical and medical equipment, healthcare products, solutions and services from leading companies from across the globe. There are also plenty of opportunities for various healthcare companies and professionals in the areas of medical training, ambulance services, retirement homes, medical equipment supplies and rural health services. Bangladesh's hospital expansion programs offers an enormous scope for medical equipment manufacturers to gain access to the country's lucrative hospital market, not to mention the huge government and private investments currently in taking place in Bangladesh aimed to upgrade the medical and hospital sectors. Acknowledged for 25 years as the leading trade fair in the Americas, Hospitalar is the most important show in the healthcare sector for both local and foreign markets. It provides the ideal platform to launch products and present innovations, solutions and services for hospitals, laboratories, drugstores, private practices and clinics. Hospitalar offers exhibitors and visitors opportunities to generate business, make new connections, deepen relationships, create brand awareness and present content. Africa Health is the largest platform in the African healthcare market for international and local companies to meet, network and do business. Medical supplies: disposable medical supplies, consumables, syringes, wound dressings etc. Medical equipment, laboratory equipment and supplies, diagnostic and diagnostic equipment and accessories, radiology, imaging, ultrasounds, electronic medical equipment, physical therapy and rehabilitation products, surgical and plastic surgery, monitoring instruments, ophthalmic equipment, dental equipment, medical furniture, medical supplies, hospital equipment etc. CPhI China is a great way to tap into the market and connect with the potential suppliers from all over the world. Aside from networking with existing suppliers, it provides an opportunity to discover new aspects about the ever changing pharma and food markets. Raw materials, fine chemicals and intermediates, accessories and dosage forms, preparations, natural extracts, bio-pharmaceuticals, contract customizations, animal health, pharmaceutical machinery, packaging materials, laboratory instrument, pharmaceutical environmental cleanliness, pharmaceutical logistics etc. Medical equipment, laboratory equipment and supplies, diagnostic and diagnostic equipment and accessories, radiology, imaging, ultrasound, electronic medical equipment, physical therapy and rehabilitation products, surgical and plastic surgery, monitoring instruments, ophthalmic equipment, dental equipment, medical furniture, medical supplies, hospital equipment etc. Are any of these exhibitions on your schedule? 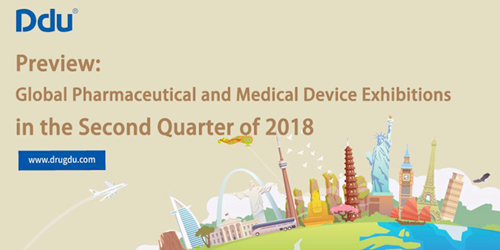 You will meet Ddu, the leading global pharmaceutical & medical device B2B online platform, at the exhibitions mentioned above. Join us and apply for joint-exhibition to enjoy comprehensive online and offline promotions to explore international business opportunities and expose your brands and products to a worldwide audience.